Note: The information in this article applies to the latest version of Visio Viewer for iPad and Visio Viewer for iPhone. Like most apps, Visio Viewer for iPad and Visio Viewer for iPhone are frequently updated to add new functionality and improve existing features. Please check back periodically for updated questions and answers. What can I do in Visio Viewer for iPad and Visio Viewer for iPhone? Print a Visio diagram to a compatible AirPrint printer. How do I install Visio Viewer for iPad or Visio Viewer for iPhone? Tap the download icon. You'll see a progress icon as the app is installed. Once signed in, you can access any Visio files stored on OneDrive, OneDrive for Business, or SharePoint. If you share a Visio file from any other app, such as Outlook, you can view that file in Visio Viewer for iPad or Visio Viewer for iPhone. Tip: If you don't see the files you want, tap Add a Place to connect to the OneDrive, OneDrive for Business, or SharePoint account you need. What are the supported file types for Visio Viewer for iPad and Visio Viewer for iPhone? In what languages are Visio Viewer for iPad and Visio Viewer for iPhone available? How do I send feedback about Visio Viewer for iPad or Visio Viewer for iPhone? 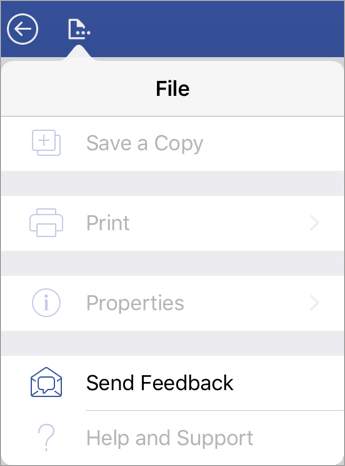 Tap the File icon, and then tap Send Feedback. Visit the Visio UserVoice forum to provide suggestions and vote on ideas that others have already submitted.